Cameron is no ordinary dog, and not just because he was born on Valentine’s Day. To Maggie, a first-grader at Burgundy Farm Country Day School, the Labrador/terrier mix with chestnut-brown eyes and “really fluffy” black hair who spends most days on campus is more like a friend. When Cameron is near, Maggie feels “really, really, happy,” she said. “I feel safe around him,” she added. “He’ll lay down and ask me to scratch his tummy,” she explained, because Cameron likes Maggie. Cameron is one of a handful of dogs at Burgundy, a K-8 private day school in Alexandria, Virginia. Dogs started showing up there when the head of school, Jeff Sindler, brought his lumbering lab, Luke, to the main office building where Sindler works. After Luke died, Sindler adopted Cameron and brought him to campus, too, where the dog Maggie describes as “really cute” became a school favorite. “They don’t care if you’re good at basketball, or a great reader, or popular,” Sindler said. “They just want to be loved—equal opportunity,” he added. Cameron and the other dogs on campus—always on a leash and with their owner—go a long way toward improving students’ social and emotional well-being, he said: They reduce tension and soothe anxiety, and elicit happy feelings from students. Hospitals, nursing homes, courthouses, colleges and universities, and other groups have pounced on such studies and brought in dogs and other animals as a way to reduce stress among their populations. But there’s one large cohort that’s usually excluded from the canine influx: children in public schools. With the exception of service and police dogs, and the occasional visit from a designated “reading” dog, ordinary dogs are largely absent from public schools. 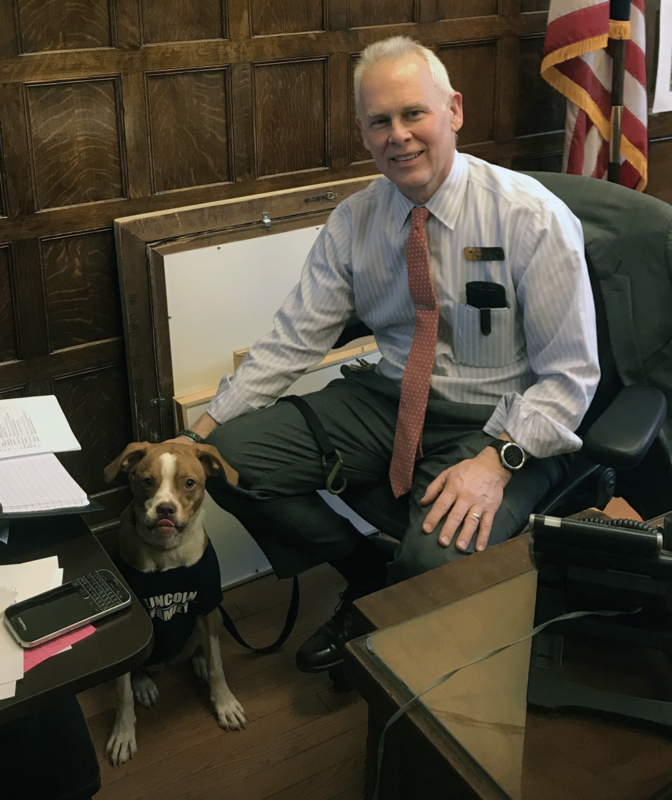 Many towns pass ordinances that forbid dogs from even stepping on school property, let alone taking up residence in the guidance department or principal’s office. Some school districts enact no-dogs rules to protect children who are afraid of or allergic to the animals and to keep school property free of dog waste. But a new program started in New York City that incorporates dogs in ordinary classrooms may be challenging the no-dogs rule. The Comfort Dog Pilot Program, launched in fall 2016 by the Department of Education, pairs select dogs from the North Shore Animal League America with participating New York City schools. Begun as a pilot with seven schools, the program expanded at the start of the 2017 school year to include a total of 42 varied elementary, middle and high schools. Chancellor of City Schools Carmen Fariña gave the go-ahead for the idea when a fifth-grade boy from Queens made the suggestion. 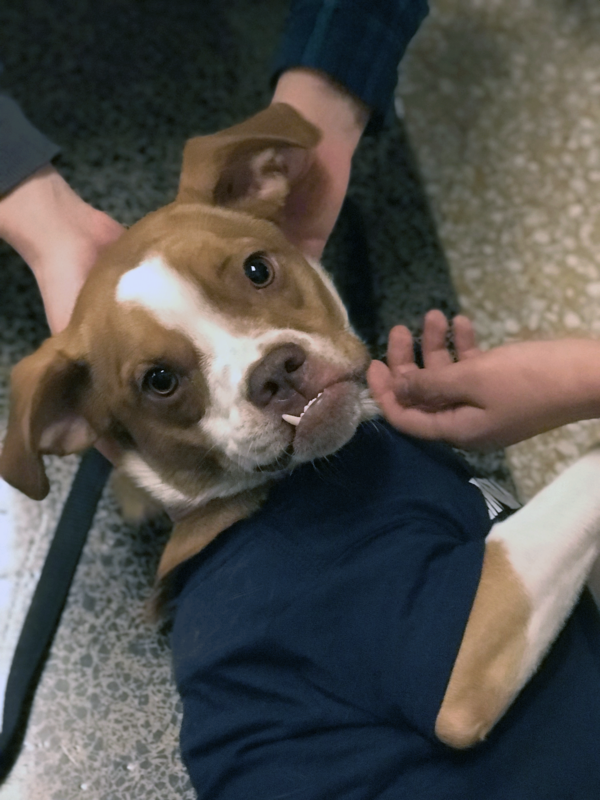 In addition to offering ordinary comfort, some of the dogs are deployed in teachers’ lesson plans to encourage empathy, cooperation and decision-making as part of the Mutt-i-grees Curriculum. “It’s an innovative approach to social-emotional learning,” said Miranda Barbot, a spokeswoman at the NYC education department who is familiar with the program. Nina is a 9-month-old boxer/beagle mix with a toffee-colored coat and a distinctive underbite. 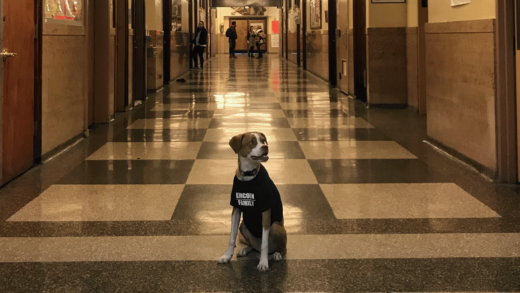 Rescued from a kill shelter in Virginia, she made her way up to New York and now trots off most days to Abraham Lincoln High School in Brooklyn with Dave Robinson, an assistant principal there who adopted her. Robinson and school principal Ari A. Hoogenboom applied to the Comfort Dog Program when they heard how well it had worked in elementary and middle schools around the city. “Our attitude was, if something’s good, let’s do it here,” Hoogenboom said. Abraham Lincoln High School educates some 2,000 kids from various backgrounds and is the only large high school in New York with a comfort dog. Hoogenboom recognized that some teenagers might not want to interact with Nina, either because of allergies, fear or a cultural inhibition. Before bringing in Nina, he sent all parents a “positive option letter” that they had to sign before their child could interact with her. 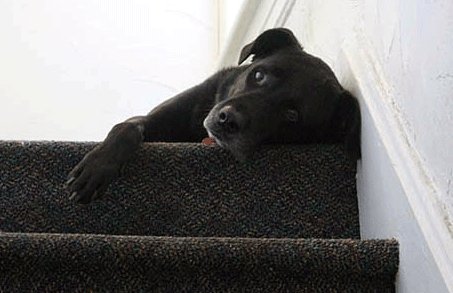 Having a dog in school requires sensitivity to faculty, too, Hoogenboom said. Nina gets to work early. In the morning, she holds office hours (with Robinson) so that students can drop in for impromptu social visits. After lunch, she spends two hours in counseling sessions with small groups of kids, where she “does the basic stuff,” Robinson said: wags her tail, looks at students with her doe-like eyes and exudes indiscriminate affection. Hoogenboom and Robinson said she has had a positive effect on both students and teachers. Attendance at counseling sessions has picked up because kids want to see Nina, and her presence in the meetings gets students to talk more openly. She has helped kids in crisis, offering elemental comfort that humans could not provide. And she sets a welcoming tone at school that has proved helpful in lowering tension. “We’ve had instances with students who were agitated and about to get in a conflict, and she helped bring them down from 10 to 0,” Robinson said. Sindler has observed similar reactions to his dogs, not only with the children at Burgundy but also among students at a year-round school in Baltimore where he used to work. Children there often came from challenging backgrounds: Many lived in poverty, or had to travel through dangerous neighborhoods to get to school, or shared a too-crowded home. When these emotionally needy children encountered Luke, Sindler’s benevolent Labrador, they relaxed and were more prepared to learn. The dog seemed to fill unmet emotional needs. For children whose primary experiences with dogs had been limited to frightening confrontations involving growling and teeth, the interactions with Luke also softened their perception of animals. For Sindler, including Luke was all part of an effort to create a safe environment where learning could flourish. Crossman from Yale is careful to point out that public enthusiasm for the efficacy of dogs as support animals far outstrips actual evidence that canines do in fact ease anxiety. Dog-crazy humans are so hopelessly partial to the animals that they might perceive emotional benefits that do not exist. Further research is needed, she said. But many students and teachers swear by them. If by some decree all dogs were forced to leave campus, something special would be lost, said Max, an eighth-grader at Burgundy who is especially happy when the math teacher’s dog lopes around during exams.